Many families worry about which nurse they will get during their birth. The nurse is a wildcard. We can pick our midwife or doctor. We can pick our doula, our birth photographer, our childbirth educator. We can pick our hospital. We don’t get a choice in our nurse(s). I’m so happy that nearly all the nurses I’ve worked with in the last few years have been amazing. 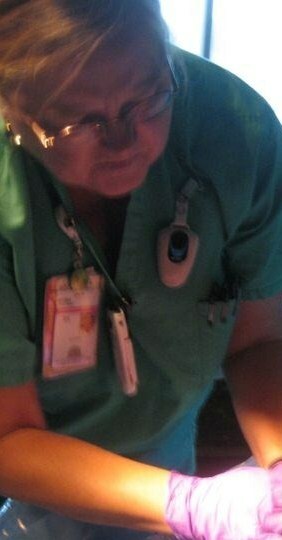 Occasionally, one nurse really stands out and shapes the birth in extraordinary ways. Like Beth two years ago. This time, I’m bragging on Mona. I adore Mona at Greer Hospital. She’s been a rockstar for many of my clients. Mona played a big role in this birth. And she caught the baby before Dr. Polo Shirt could arrive at this birth. So I knew I could relax when I saw Mona walk into the birthing room. What made her support so extraordinary at this birth? She kept interactions with the mama at an absolute minimum. Mama stayed in the tub and the door to the bathroom remained closed 99% of the time. She used a handheld doppler for quick listens to the baby’s heartrate while mom was in the tub. She also used a handheld monitor while mom was pushing. My client didn’t have anything strapped around her belly. She ran interference when the doctor preferred that the mom get out of the tub sooner rather than later. She stalled when another nurse prompted that the mom needed a hep-lock. The mama never did get that hep-lock. She applied hot compresses on mom’s perineum when baby was crowning. She patiently and quietly guided this first-time mom and then called the doctor in a few minutes before the baby was born. After the birth, she didn’t fuss with the baby or try to talk to the mother. She stepped back. After an hour, she still didn’t fuss with the baby or suggest taking her. In fact, when I left, mama was breastfeeding her baby and blissfully devouring her own lunch tray. I love this nurse. She is a strong and quiet presence. If you give birth at Greer Memorial and Mona walks into the room, relax. You’re in very good hands. Posted in Birth, Doula and tagged greenville childbirth, greer memorial hospital, natural birth greenville. Bookmark the permalink.